Mission Statement for Watertown Police Foundation, Inc. 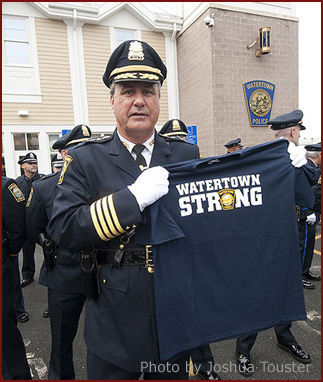 The Watertown Police Foundation, Inc. is a tax-exempt, not-for-profit Massachusetts corporation formed spontaneously by concerned citizens of Watertown, Massachusetts immediately after the tragic, but ultimately heroic events that occurred in Boston, Massachusetts on April 15 with the terrorist bombing of the Boston Marathon, and then in Watertown, Massachusetts on the evening of Thursday, April 18, 2013 and morning of Friday, April 19, 2013, when officers of the Watertown Police Department, with the help of others, confronted and eventually killed or captured the suspected terrorists. The purpose of our organization is to help the Watertown Police Department, and the Watertown community at large, cope with the challenges we face in the aftermath of these wrenching events -- events that directly touched the lives of virtually every Watertown resident. In the short term, our mission is to raise funds that can be used to provide support and counseling programs for affected police officers, and affected residents of the community, including many families with young children who are struggling to return to normal in the aftermath of having their homes and neighborhoods turned into battlegrounds by genuinely evil people. As of today, April 26, 2013, there remain many homes and automobiles in the immediate area of the shoot-out that are punctured by bullet holes, resulting from the wild gunfire instigated by the terrorists in their desperate efforts to escape justice. The Watertown Police Department personnel were fortunate to avoid serious injuries, but an MBTA officer was seriously injured, and a police officer at MIT was assassinated by these same terrorists earlier in the evening, so the intention to cause as much grievous harm and injury as possible was clear the goal of the terrorists. Although, the Watertown police officers were fortunate to avoid major physical injuries, the officers involved -- and many civilians in the Watertown community, particularly those in the direct line of fire – are unavoidably traumatized by the horrific events inflicted upon them. We must all recognize that trauma of this nature is as real an injury as a gunshot wound, and this shared community trauma now needs to be addressed and dealt with as promptly and effectively as we can. Although human lives and human health are foremost in our minds, there are also practical realities about the other costs inflicted upon Watertown and the Watertown Police Department. At least two Watertown police vehicles were destroyed by the bombs and/or gunfire, and a third vehicle will require extensive repairs. Residents also need help in repairing the damage caused by the violent eruption of gunfire in a quiet residential neighborhood. I hope that you, as you read this page, will consider assisting our community and our police officers at this time. The seven police officers who were directly involved in the firefight should be particularly recognized and commended for their bravery. These seven are each ordinary men who performing their jobs under extraordinary circumstances, and that is probably the best definition we have of a True Hero.